We make this 7 kari kootu (kootu made with 7 veggies) for thiruvathirai and pongal. Its very flavourful with all our ‘naatu kaigari’s. Please refer the notes for the vegetables choice. This is one of the main Pongal Recipes. We make sakkarai pongal, vellai pongal, this kootu, vadai and vendakkai sambar on Pongal day. Some times make Kallkandu pongal also along with this. The most thing I like about pongal is ‘Karumbu’. Me and brother sit chew karumbu sincerely through out the day. My mom or dad will sometimes peel off the skin and chop into bite size pieces for our easy. What are the vegetables to be used in ezhu kari kootu, pongal kootu? Any naatu kaai can be used, parangikkai, mochai, avarakkai, vazhakkai, sakkarai valli kizhangu, seppankizhangu, karnakizhangu. Pressure cook moong dal for 2 whistles and keep aside. Peel off the skin of yam, arbi, sweet potato. Wash and chop into tiny cubes. Chop the broad beans finely. Boil 1 cup of water and add these veggies+ mochai, turmeric and salt. Meanwhile peel off the skin of plantain and yellow pumpkin and chop into tiny cubes. Add it along the veggies boiling and cook until soft. Grate coconut mean while and grind it along with jeera, rice flour, green chilli and little water to a coarse paste. Add the cooked dal, coconut paste and bring to boil. Temper with the items given under ‘To temper’ table and mix well. While the veggies are getting cooked, you can add few curry leaves (torn into two). This gives nice flavour. Using coconut oil for tempering also enhances the flavour. 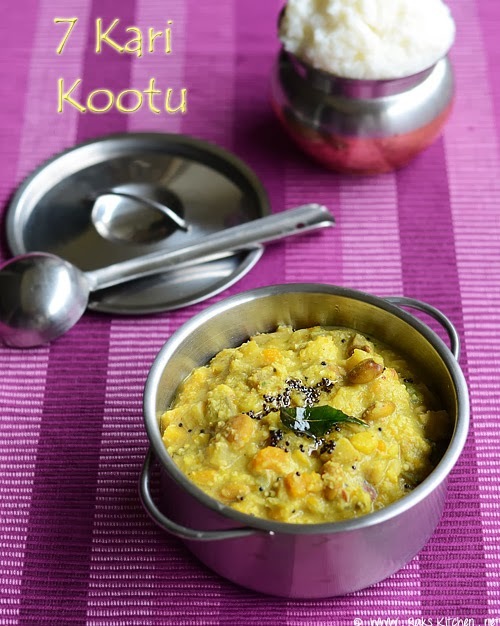 What are the vegetables to be avoinded in this ezhu kari kootu, pongal kootu? : ‘English veggies’ like carrot, beans, potato etc..; brinjal, snake gourd, ash gourd, bottle gourd, ridge gourd, ladies finger,drumstick. We add all ‘gastric veggies’ in this. So its good to add jeera in this kootu. Do not add yam more as it will be giving itchy feel. Do not add sweet potato and yellow pumpkin more as it will turn sweeter. I love this kootu with sakkarai pongal those days. Yeah its weird, but I do eat this way as I dont like to eat too much of sweet continuously those days. This is very very flavourful kootu. Paarthale Pasikarathu!!!! So Delicious !!! Ongoing events:Fast Food – Poha . Raji what is mochai? is it dry beans? You are making me feel very very hungry and run for grasping some food. Kootu is looking too lovely. Its a must for us, i cant imagine pongal without this kootu. wow! look at those vegetables. i am very jealous. how can a mix of all these taste anything but great. kootu with so many root vegetables, tasty! Like the combo of all vegetables. Looks super comfort. You and Jeyashri have posted the same one 🙂 Lovely kootu and the recipe i use has toor dhal… must try your mung dhal version once. My mother in law makes thalatha kozhambu which is similar to your kootu. It is a winner for sure. Delicious n healthy curry! !! Drooling clicks!! Raji, thanks for this authentic recipe. Nice combo of veggies and kootu looks yummy. Very traditional recipe.. I love the medley of veggies ..
wow looks super tasty never heard of this kootu ,Looks intresting must try it. Delicious dish!! Thanx for sharing!! I had tasted this at one of my friend's place, yours looks absolutely divine. Bookmarking it. Happy Pongal to you & yours. WOw lovely kootu Raks…reminds me of the Thiruvadharai Upperi that I make during the Thirivadharai. Many things that we all cook are made during different occasions…Love the mat color! Nice and flavorful kootu, Beautiful memories too. romba nalla irukku!!!! so delicious!!! very festive!!! Raks, you are an absolute genius with presentation. I always read your blogs and find that there is rarely anything that I can't understand or is missing, very thorough and detailed explanation. Kudos!! Hi Madam,should we avoid brinjal in this kootu? what does seppan n karna kizangu means… avrekayi n mochai are same or wt….